As Rukmani and Nathan earn more money, they anticipate their return home more and more. Even Puli shares their excitement. One day, Nathan says he will return directly to the temple after work instead of shopping in the market with Rukmani. He’s feeling tired. For the first time, Rukmani’s fortunes are explicitly connected to money instead of to the fruits of the land. Rukmani buys rice cakes from her usual vendor, and purchases extra sweet cakes as a treat for Puli. Emboldened by the extra spending, they stop in front of a man selling small toy carts. Puli is entranced by the beautifully carved toy, and Rukmani can tell he’s longing to own it. She points out sensibly that he has his own money from begging, but can’t resist his childish eyes. She buys him a toy and even purchases a second one to bring Sacrabani when she returns home. Puli’s desire for the toy emphasizes his youth, which Rukmani is often tempted to forget because of his independence and street smarts. That she buys him a present signals her acceptance of him into her family, and her optimism about eventually returning home to her own children and grandchild. When they reach the temple, Rukmani shows Nathan her purchases, both excited and ashamed to have spent more money than usual. However, Nathan looks ill and soon staggers away to vomit. He says he has felt feverish since the morning, and when Rukmani feels his body, it is burning hot. She tells him to lie down and massages his limbs. Nathan’s illness is obviously a result of age and physical stress, but the fact that it coincides with his arrival in the city suggests that urban life causes a kind of psychological malaise and breakdown. It rains the next day, and Rukmani urges Nathan to stay behind while she goes to the quarry, but he refuses. Because of the rain and mud, the work is especially hard today. Nathan is sick and panting, but he doggedly tells Rukmani he will rest when they reach home. They continue to work in the rain all week, even when the weather is so bad that Puli refuses to come to the quarry. Work in the quarry might not be harder than work on the farm, but it lacks the dignity and tranquility that farm work inspires. This contrast is one of the reasons that Rukmani elevates rural over urban poverty. After waiting in line for payment one evening, Rukmani finds that a small crowd has gathered around Nathan, who has fainted on the side of the road. Two men pick him and carry him to the temple, while the women console her and ask how long her husband has been sick. They say she should ask her sons to take care of him, and Rukmani has to admit that her children are all dispersed and unable to help. The fact that Rukmani relies on strangers to convey her husband and console her emphasizes the dissolution of her family. It’s important to note that this tragedy isn’t a result of her own behavior but rather the injustices inflicted on her by a society which does not prioritize the needs of its impoverished classes. Connelly, Irene. 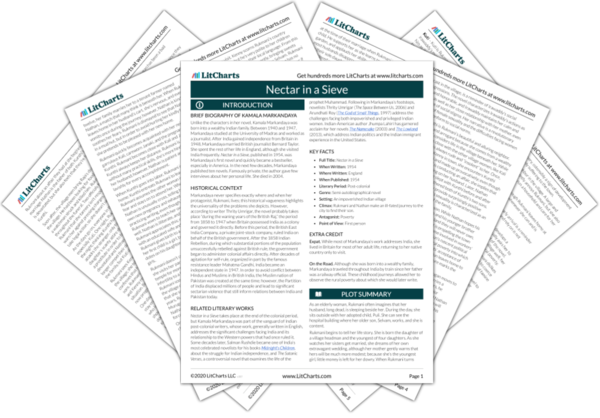 "Nectar in a Sieve Chapter 28." LitCharts. LitCharts LLC, 30 Oct 2018. Web. 11 Dec 2018. Connelly, Irene. "Nectar in a Sieve Chapter 28." LitCharts LLC, October 30, 2018. Retrieved December 11, 2018. https://www.litcharts.com/lit/nectar-in-a-sieve/part-2-chapter-28.